The email about “Season 4” will go to Season 3 supporters Feb. 13th. I wanted to give you some time with the new book to see if you felt it was worth your investment to sign up for another year. Any untaken Season 4 slots will be made available on a first come-first serve basis later in February and will be announced on the site. If you were too lazy to watch the video in the last post, the Jerx returns on Feb. 11th. There seems to be a resurgence in people saying, “If you have good audience management, people don’t want to look at [insert magically altered object here].” If you believe this, I would take this test for dementia, because there’s something wrong with you. Your brain isn’t getting enough oxygen. Wanting to look at the object is part of the normal, human response of taking interest in what you’ve shown them. You can’t “manage” your way around that. I’ve written about this 1000 times already (See WWJD, and Final Exam for a couple examples) so I won’t get all into it again. It’s just annoying because it’s the laziest sort of non-answer to legitimate concerns. “Doesn’t the audience want to see the bottle with their cellphone inside it?” No, no. You just need proper audience management. I always like to ask them what this sort of “audience management” would look like if I were to see it. They never have any real response. It’s just a phrase they use to avoid dealing with the realities of the effect. Our girl, Stasia, is releasing her Empty Cup Oracle Deck soon. You can buy it on her Etsy site. If you’ve got at least three brain cells rattling around in that big melon of yours, you will see the many opportunities to use this in a magic/mentalism context. 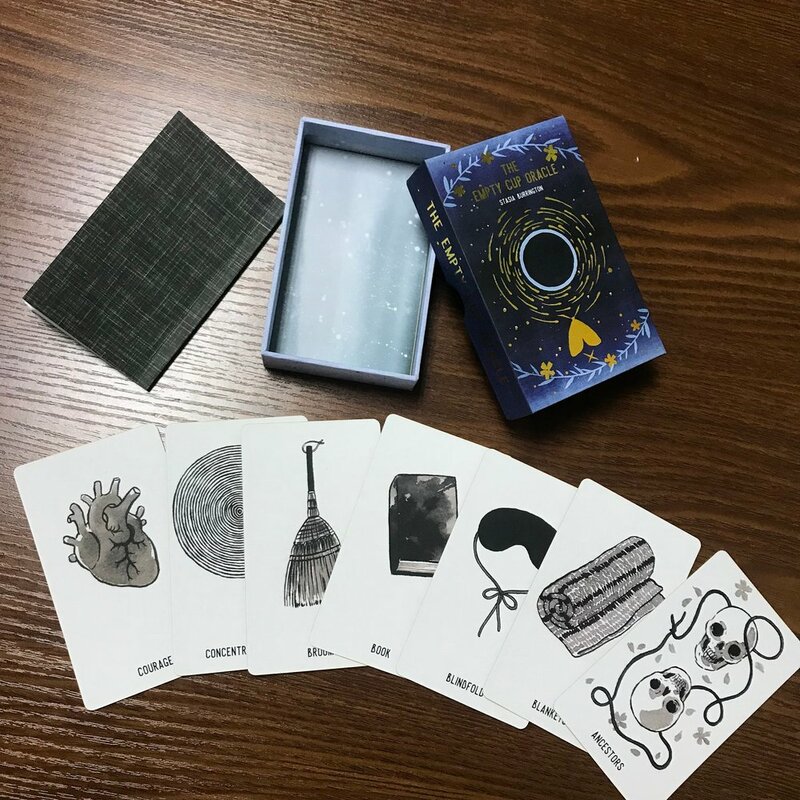 It’s naturally more intriguing than a deck of cards, but the imagery is simpler and more easily interpreted than a tarot deck. Pick one up and support our friends.